Seamus Williams-Sharkey has chalked up an impressive CV, made all the more remarkable given he was only born in 1991. 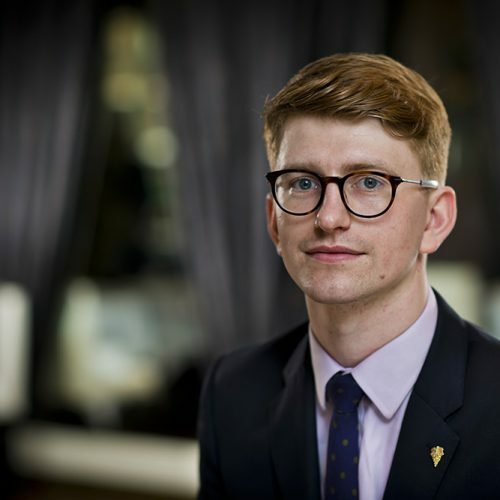 Growing up in the Midlands, he began his career in hospitality at The Dormy House in the Cotswolds aged 19, where he began studying for his first WSET qualifications. From there he joined The Nut Tree Inn in Oxfordshire as a sommelier, working under Frank Embleton for the first six months, from whom he learned a great deal. To gain further experience, Williams-Sharkey wrote to every then two- and three-starred Michelin restaurant in the country to ask if he could work with them free of charge for a two-week stage. Thanks to his persistence and a contact at Bibendum Wines, he managed to gain stints at Gordon Ramsay’s Hospital Road, Sat Bains’ eponymous restaurant in Nottingham, London’s The Ledbury and the Hand and Flowers under Tom Kerridge. In 2013, at 22, he moved to Hampton Manor to become restaurant manager and head sommelier. Before he started at The Ledbury, Williams-Sharkey spent a year as head sommelier at Tom Sellers’ Michelin-starred Restaurant Story. There he was responsible for quirky projects, such as digestif-and-chocolate pairings featured on a ‘Bedtime Story’ menu. Among the pairings were: Barsol’s Mosto Verde Quebranta Peruvian Pisco with Akesson’s Ambolikapiky plantation 100%-cocoa from Madagascar; and Ilegal Mezcal Reposado from Mexico with Mast Brothers 75% cocoa from Papua New Guinea. Now firmly ensconced at Brett Graham’s two Michelin-starred The Ledbury, where he has spent the past three years, he is noted for his passion, breadth of knowledge and desire to exceed guests’ expectations. Williams-Sharkey presides over an extensive and impressive 40-page wine list that includes Vin Jaune from the Jura, biodynamic Bordeaux (Château Falfas) and a healthy smattering of Australian wines following a trip there in 2017. The Ledbury itself has been buying in and storing wine over the past 10 years, allowing it to pull out older vintages. This includes the wines of Domaine Didier Dagueneau in the Loire, Burgundy’s Domaine Coche-Dury and Vouvray’s Domaine Huët. Its wine list is ranked 23rd overall by Wine List Confidential, and ninth overall in terms of service – a testament to William-Sharkey’s talents as a sommelier.